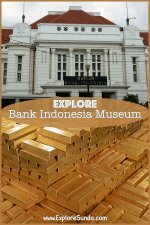 As one of the most interesting cities in Sunda, Bogor offers lots of things to do. It has delicious local cuisine, beautiful botanical garden, as well as unique shopping experience. It is a perfect place for one day trip or even a weekend getaway, since it is only 50 kilometers south of Jakarta. Despite of their proximity, its weather is not as hot as Jakarta. It is much cooler, thanks to the frequent rains. And that’s how it got its nickname as Rainy City. If you plan to spend a night here, there are many hotels you can choose. Starting from the chain hotels such as Novotel and Santika, the heritage hotel such as Salak hotel or smaller and cheaper hotels, they are all offering their uniqueness. Bogor has always been chosen as the capital city of many kingdoms in Sunda because of its geographic. It is close to the major harbor in Jakarta, which was called Sunda Kelapa harbor at that time. On the other hand it lies in the mountain, which made good defense against the enemies. An inscription from the fifth century mentioned a Hindu empire named Tarumanagara was located in this area. It is the first kingdom in Indonesia. Another inscription from 1533 said that it was the capital city of Pajajaran Empire. During Dutch colonization, Governor General Gustaaf Willem Baron van Imhoff found this area and called it Buitenzorg, which means no worry. 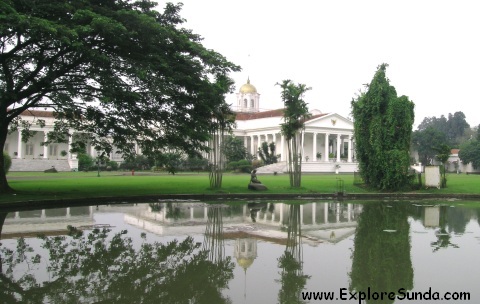 He built a palace here as well as the road to Batavia (the former name of Jakarta). The palace now became one of the six presidential palaces in Indonesia. As the nickname of this city implies, rain falls almost everyday, which makes it a perfect place for research on botany. Presently, it is the center of botany and agricultural research in Indonesia, supported by the botanical garden as well as Institut Pertanian Bogor (Agricultural Institute), the leading state university in Indonesia. The garden is a great park for family picnic and recreation, as well as the center of knowledge with its plant collections. This beautiful garden has always been my favorite place. The presidential palace has always become the landmark of Bogor. It lies in the heart of the city, surrounded by hundred years old trees. Built during Dutch colonization, it has a huge backyard, which is now becoming the botanical garden. Although it is a very slim chance to meet our president here, you can always feed the permanent resident of the palace: the deer! As the latest destination in this city, De Voyage is a garden decorated with European theme, i.e. European houses and miniatures of several outstanding landmarks in Europe, such as Eiffel tower and Manneken Pis. One of the popular shopping destination in this city is the bag home industry in Tajur. Nowadays it is not only a warehouse open up selling many kinds of bags but it has grown into a one stop tourist destination! Alternatively, we could go shopping in the factory outlets and shopping malls, such as Botani Square. There are many delicious local cuisines you can try in this city. They vary from the traditional foods such as ngohiang (rolled minced meat) and asinan (a spicy and sour fruit salad) to the creative food such as roti unyil (mini buns), apple pie and macaroni schotel. Suryakencana street has always been the number one destination for the culinary adventure in Bogor. However, we also can find various restaurant on Pajajaran street, since it is a very close distance to Jagorawi toll road. There are many chained fast food restaurants in this area. If you are looking for a Sundanese restaurant, we, from ExploreSunda.com, recommends De' Leuit restaurant on Pakuan street. It is a small road behind Pajajaran street. 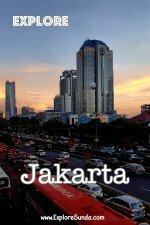 This city is approximately 50 kilometers south of Jakarta. If you live in Jakarta you can go there by driving through Jagorawi toll road. The easiest way to enter this toll road is from inner city toll road or if you live in southern Jakarta such as Pondok Indah take the outer ring road toll. Once inside the toll, find the direction to Bogor or Jagorawi Toll Road. Alternatively, you can take a train called Pakuan from Gambir Railway Station in Jakarta. This is a commuter train, hence, it won’t be crowded during weekends. Each city and town in the land of Sunda is unique. 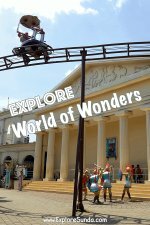 For example, Bandung is known as the shopping paradise, while the town nearby such as Lembang and Ciwidey offer great outdoor fun.